This time next week, the first day of the Tour d’Art will be done. Tom Krueger will be moving his pottery, painting and mixed media into the greenhouse and I will be opening up my studio for a couple of days. Since there is no Art Studio Tour this year this will be the only time for the public to get the behind the scenes studio experience. All of the details can be found on my Events page. I should have have posted this a little earlier, but a lot of my time has been spent getting our newly adopted pups accustomed to their new home. 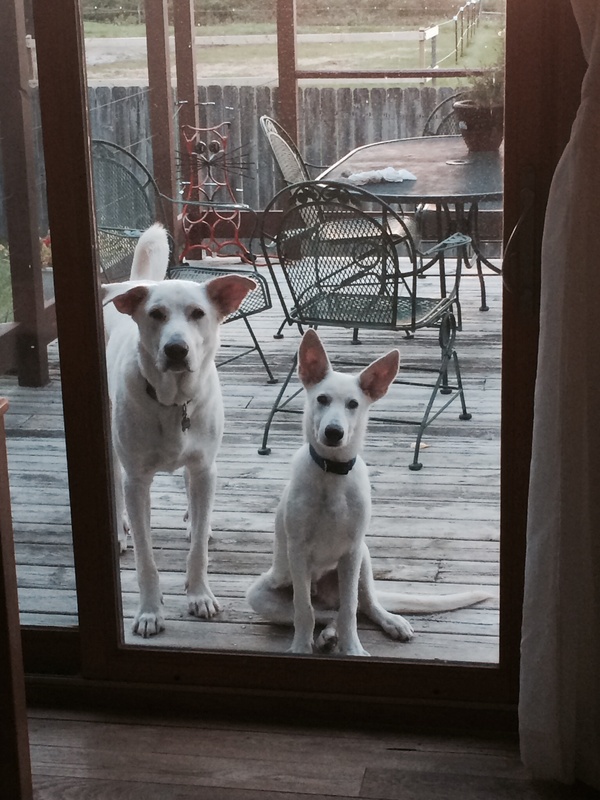 Yeah, we went kind of crazy and adopted a 2-ish year old White Shepherd/Great Dane/who knows what else dog and a 5-7 month old White Shepherd puppy last week. Having so much fun with them. So, instead of artwork I am posting a picture of the new family members. Hope they don’t mind visitors next weekend! This entry was posted on September 26, 2014 by Kimberly Lyon. It was filed under abstract, art, fused glass, glass, light, macro photography, photography and was tagged with abstract, aluminum, circles, close-up, fused, glass, images, macro, Macro photog, macro photographs, Macro photography, melted.